The main drag of Greenside has been a preferred destination of many Joburgers seeking a good night out for any number of years. A group of us recently went to Mishmash, a casual restaurant and bar on Gleneagles Road. It is very happily situated next to the bottle store, and we all know what that means….. Really well priced wine! The restaurant itself is set a little off the road, where the Spar used to be. You have to walk through the dingy parking lot to reach it, but it gets a whole lot more charming when you get inside. A large, greyish, cavernous space, with long tables and simple décor, it’s like walking into a sitting-room mid cocktail party. A bar takes prominence and there are some unusual views into the fridges and freezers. We arrived earlyish and it was already buzzing with a pretty hip crowd; most relaxing in this warm and inviting environment – some readying themselves to prop up the bar later in the evening. Of course, our first order of business was to get the wine flowing. The wine list is comprehensive; it boasts all your old favourites at retail prices – a fraction of those I have seen at any other restaurant. We had some Diemersfontein Rosé which was selling for about R50.00 per bottle, and we sampled a large range of everything else on offer in terms of wine and beer. All set with our value drinks, we set about deciding what to eat. The menu at Mishmash features staple, wholesome cafe fare and the promise of fresh produce. Nothing is particularly complex, and there aren’t that many options. 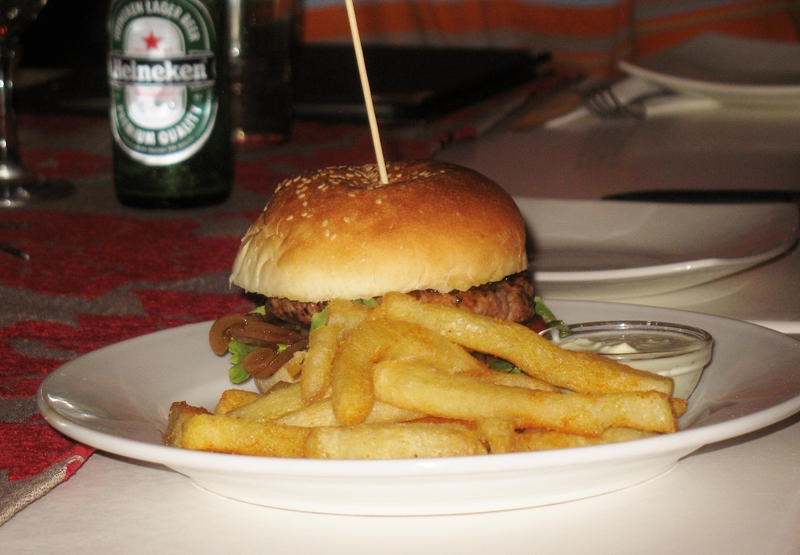 They have a range of pizzas, some pastas, salads, burgers, fish ‘n’ chips and steak dishes. Whatever you order, you will surely be able to also get your hands on the perfect wine to accompany it. The most popular order at our table was the pizza. These are crispy-crust thin with a rich, tomato base. 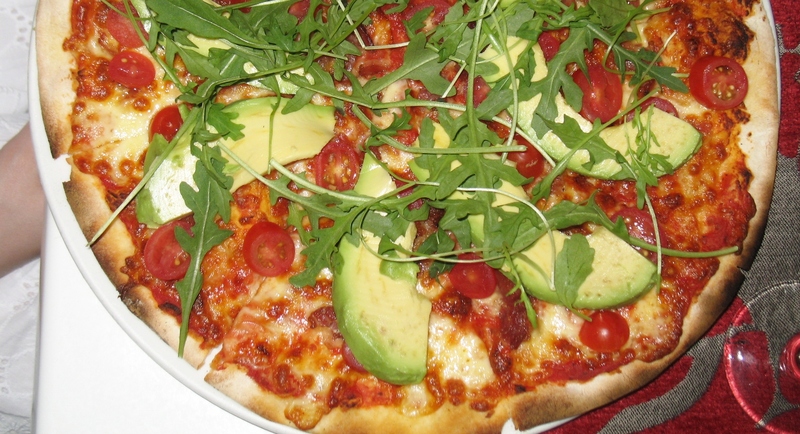 Toppings vary from bacon, feta, avo and rocket to prosciutto, peppers, mushrooms and olives. The Meat Pizza, topped with a delectable slow-cooked beef was quite a hit. Unfortunately some of the other pizzas were rather bland. The fish and chips was also a top notch dish – it was served traditional-style, wrapped in newspaper. The batter was really crispy and thin fries well cooked. Another friend had the fillet. A large portion in a rich sauce, it was cooked to perfection at a scrumptious medium-rare. We were a bit disappointed in the potato wedges, though, which were quite soggy. The service at Mishmash was friendly and the waiters knowledgeable about the menu. However, our food didn’t all arrive at the same time, with fillet dishes getting to the table long after all the other food got cold. It was a pity that this wait was so lengthy, and some of us had almost finished eating before others started. Mishmash might be very chilled, but this kind of service really puts the “lax” into relaxation. One redeeming feature of the service was that the Chef, Sean Ackerman did the rounds of the restaurant at the end of the evening. This often only happens in fine-dining establishments, and it was encouraging that the food at Mishmash is considered as important as the vibe and the drink – so cheap alcohol is not all it’s about. If you’re planning a party and want a great venue, which will not break the bank and promises to deliver all the festivity and fun you anticipate, Mishmash is a great option. It has just the right mix of understated style and party vibe. A main course and copious amounts of wine cost us R 150.00 per person including tip – a real steal.